I’ve been circling this book for a while, waiting for the right time to jump in and absorb it. Finally I’ve pushed the rest of my reading list to the side to tackle it and it hasn’t disappointed. 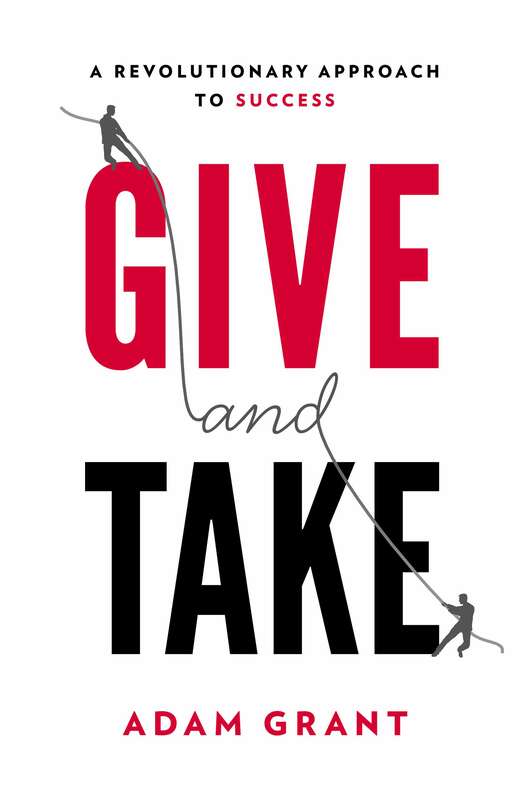 Adam Grant’s Give and Take is a modern classic. Grant highlights the importance of a giving nature to success in professional life. Grant is a professor at The Wharton School, where he is the highest rated teaching staff member teaching Organisational Behaviour, Management and Psychology. In between teaching duties he conducts broad ranging research and writes. The central thesis of Grant’s book, is that the selfish, narrow minded desire to get ahead at all costs in professional life is wrong, and that the age old adage “nice guys finish last” is only partially true. Grant’s own research and studies of other organisational and psychological studies shows that it is people who give a lot who tend to succeed more. Grant’s research shows that most people tend to fall into one of three categories in professional environments. Firstly there are ‘givers’: those who give their time and discretionary efforts to others no matter their place in the hierarchy or favours/efforts received from others. Secondly there are ‘matchers’, those who are willing to give their time and efforts to others, but only to the extent of favours and efforts they themselves have received. Finally there are ‘takers’, those who do not give their time and effort to anyone, but are happy to receive the benefits of others giving. Most would tend to think that ‘takers’, the selfish professionals who only take and do not give will end up at the top of the food chain, while their more selfless colleagues the ‘givers’ would end up at the bottom. However, in an interesting paradox, Grant’s research shows there are two types of givers and that givers are actually the least and the most successful in professional life. The least successful givers are those who willingly give of themselves, but allow themselves to be taken advantage of due to having a timid nature, being too available and too empathetic. They are essentially pushovers. The most successful givers are those who are able to be selfless and giving, but understand they must balance their giving with control of their time, availability and empathy. They are more assertive, strategic and intentional with their giving, which makes them powerful leaders. Grant’s research is powerful and his conclusions are emphatic. They also raise interesting questions for educators, where traits such as empathy and availability are sought after. Education is also an industry where it is a prerequisite to have a giving nature. Can you name a teacher who doesn’t want to give something back? Yet schools are organisations like any other, with givers, matchers and takers; we also have our fair share of pushovers. This book is a brilliant way for educational leaders to reflect on their own place on the giving/taking spectrum and develop their leadership. It’s also a great framework for reviewing their schools, leadership teams and staff to evaluate who the givers and takers really are. Next Post Three great books I haven’t blogged about yet – but that every educational leader should read!